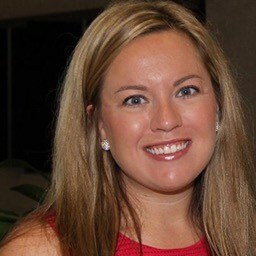 Hello and welcome to another week of the TERM® blog series! This week we will be continuing our summer blog series titled Building Out Bugs by highlighting a way you can block pests on the vertical surfaces of a home or structure by using TERM® Flashing Barriers. While it is integral for pest exclusion to have a horizontal barrier, it is equally important to complete the building envelope with vertical barriers. TERM Base Flashing Barrier is, like our other membranes, a “peel and stick” barrier membrane used where waterproofing, energy sealing, and insect exclusion is needed. TERM Base Flashing Barrier is applied where the horizontal concrete slab intersects with exterior sheathing. This area is a frequent entry point for termites which have come up on the outside of the foundation wall. Additionally, the TERM Base Flashing Barrier ties in to the previously-applied TERM Sill Plate Barrier (see our last blog). 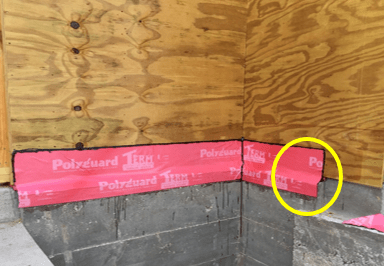 The TERM Sill plate barrier extends past the sheathing board by 2 inches, allowing the TERM Base Flashing to form a strong connection and protecting the structure from termite intrusion. The yellow circle highlight the connection between the TERM Base Flashing and Sill Plate Barrier. Together, they form a strong connection and protecting the structure from termite intrusion. The picture below shows what the TERM® Sill Plate Barrier looks like when installed and the structure has been dried-in. While the sills are protected from beneath, there is still visible light coming into the structure from the exterior. Don’t worry! 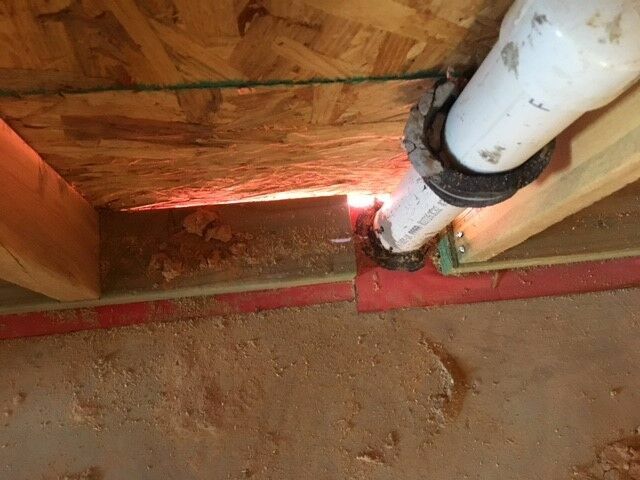 With the TERM® Base Flashing Barrier, that light will not be visible in the finished structure. Energy will stay in the home, and air and insects will stay out. TERM Seam and Window Barrier is also a fully-adhered, peel and stick, non-chemical barrier membrane applied over sheathing joints, and as a window flashing where both waterproofing and termite exclusion is desired. Sheathing joints are potential entry points for termites which have accessed the exterior wall via the exterior foundation wall, and climbing over the TERM Flashing Barrier installed at the base of exterior sheathing. Windows are a frequent entry point of both climbing and swarming termites. 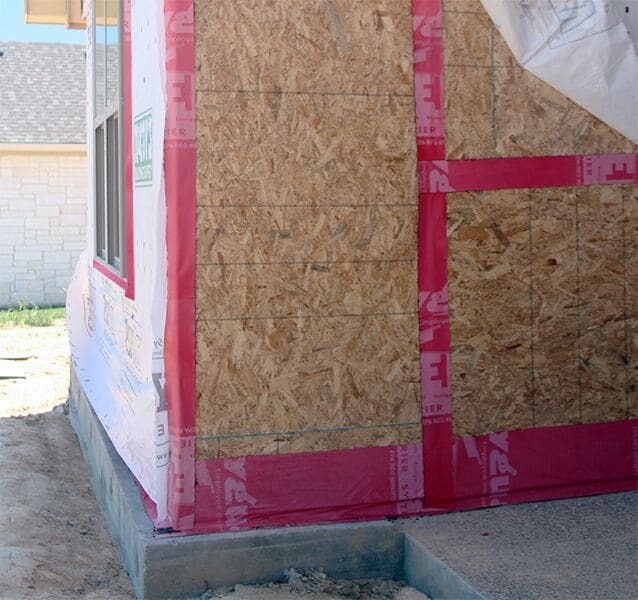 TERM Flashing Barrier for exterior sheathing joints is tied in to the TERM Base Flashing Barrier. This connection continues the vertical pest barrier. 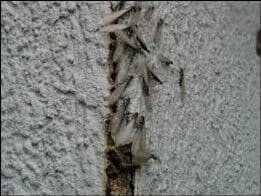 Without the proper barriers in place, damage by termites to your home or structure could be catastrophic. Alate termites entering a structure through an exterior sheathing joint. 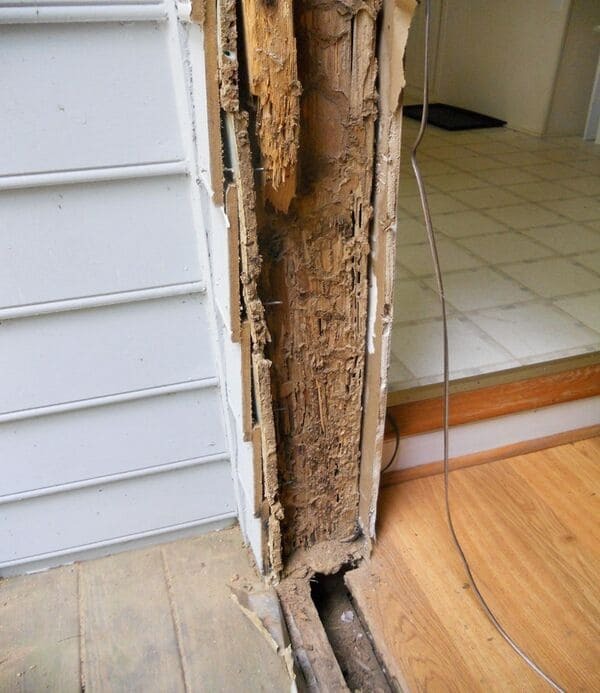 Termite damage to an unprotected door frame. TERM Flashing Barrier and TERM Seam and Window Barrier are made of the same material. The only difference is in roll widths: TERM Seam and Window Barrier is available in widths between 4” and 8”, and TERM Flashing Barrier is available in widths between 12” and 48”. 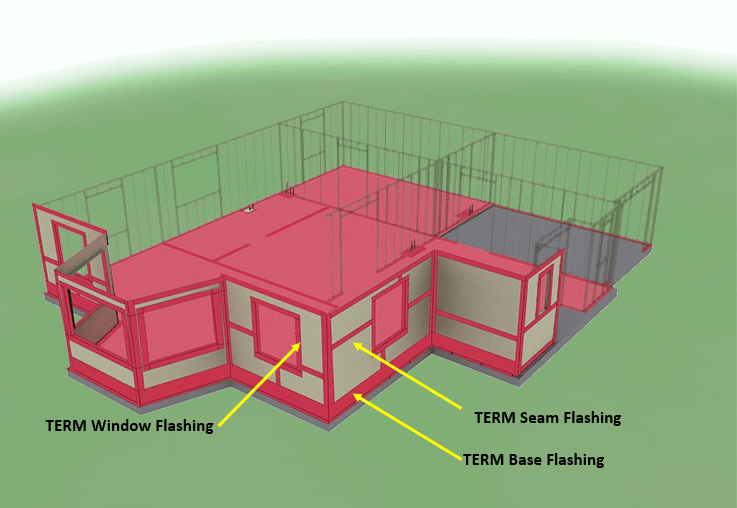 It’s important to note that the TERM® Flashing Barriers are intended for new construction. Check us out next week for the next blog of the series, Building Out Bugs: Isolation Joints where we will talk about our innovated isolation joint product. 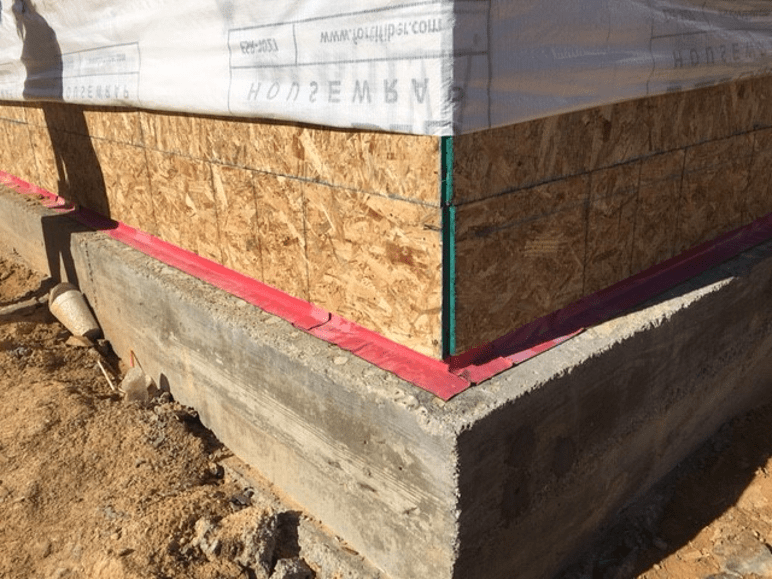 TERM Flashing Barriers are a component of the pesticide-free TERM Barrier System which, when properly installed as part of the building envelope, acts as a barrier to almost all pests. Because almost all pests are excluded for the life of the structure, the need for pesticide treatment should be permanently and drastically reduced. To inquire about TERM® Flashing Barriers for your next home or building project, or for additional information on the TERM® Barrier System products, please feel free to email me at ckrejci@polyguard.com.